Curb appeal is one of the most important factors in house value, and if landscaped and maintained properly it can significantly impact your return on investment. Landscaping and maintenance both play an important part in first impressions when approaching your home, especially when done by a professional. 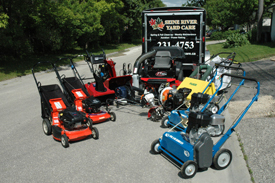 You should make Seine River Yard Care your yard maintenance company for your home, business or both. We have a variety of services and our services can be tailored to meet your needs. We have the equipment for the lawn and garden. Our professional tools are sharp and well-maintained – ready to mow, trim, edge, weed, hedge, till, prune, plant, and more. If your yard is out of control, you might not even want to look at it. We can clean it up, and give you a great looking yard or green space. Our services include Spring Clean-up & Fall Preparation, Snow Clearing and Lawn Maintenance and Landscaping during the summer. Aeration &fertilizer are just some of our other summer services offered. Landscape/Hardscapes & Regular weekly lawn service are our most popular services, but we have many other options to choose from. Lawns look better if cut on a weekly basis, and we make sure yours will get cut regularly. Gardens can be weed-free, and your walkway neatly edged. With everything done, you will have more free time. Trees, shrubs and flowers can be picked up and planted. We will replace dead or dying plants in your garden, or just remove those stubborn bushes to make way for more colorful plants. We can help with suggestions, and lay down some mulch or rock as a new backdrop to showcase your home. Seine River Yard Care is WCB & Liability insured, giving you peace of mind while we are working on your property.